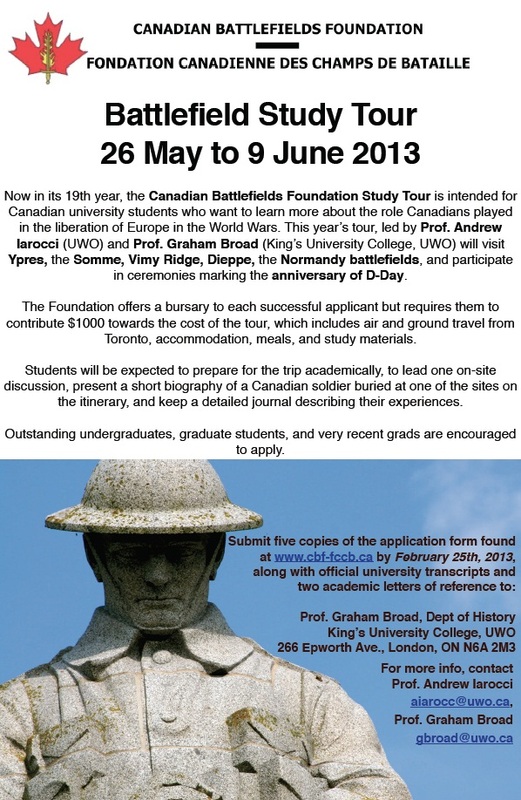 “Now in its 19th year, the Canadian Battleﬁelds Foundation Study Tour is intended for Canadian university students who want to learn more about the role Canadians played in the liberation of Europe in the World Wars. This year’s tour, led by Prof. Andrew Iarocci (UWO) and Prof. Graham Broad (King’s University College, UWO) will visit Ypres, the Somme, Vimy Ridge, Dieppe, the Normandy battleﬁelds, and participate in ceremonies marking the anniversary of D-Day. The Foundation offers a bursary to each successful applicant but requires them to contribute $1000 towards the cost of the tour, which includes air and ground travel from Toronto, accommodation, meals, and study materials.